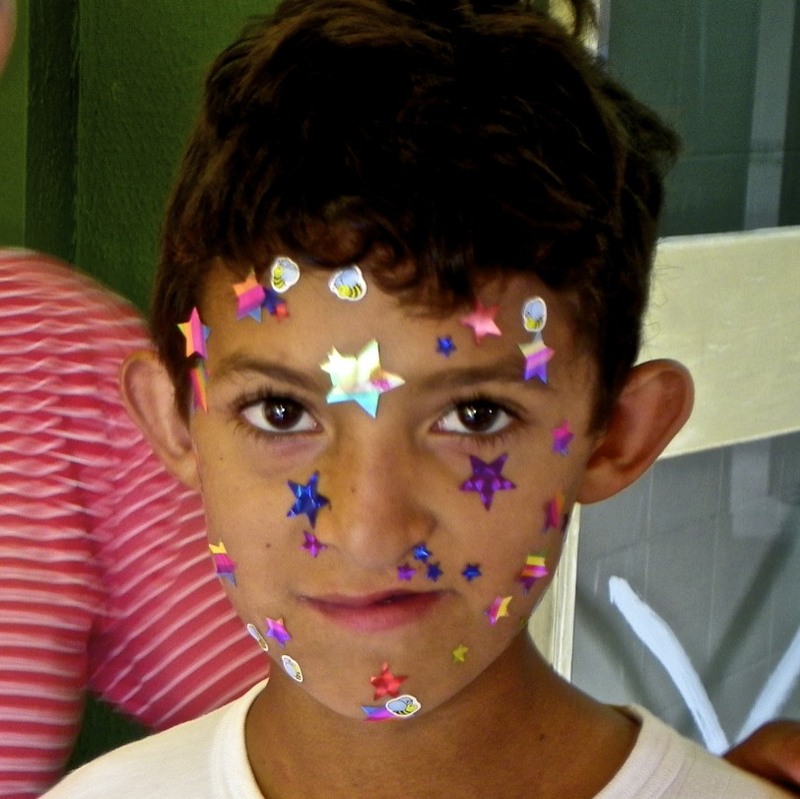 The first day at the hospital on our mission to Paraguay with Operation Smile, was amazing. So amazing. I hardly know where to start. The hospital is part of a military base which we entered through a gate guarded by soldiers with great big, scary looking guns. The sight of them seemed so incongruous to what we were there to do. We passed though the security, and in the field next to the hospital, we got the first look at the waiting parents and children; many had arrived the day before. Hundreds more had arrived since. Busloads more would arrive through out the day. 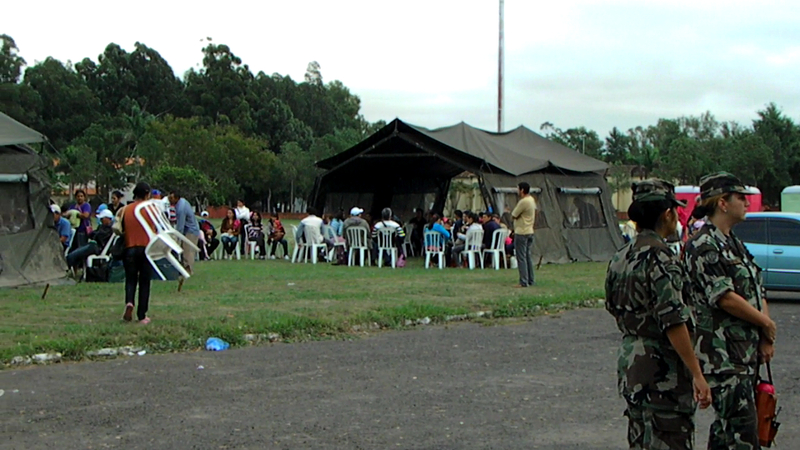 Large tents had been erected to provide shade (by the Army peeps, who could not have been nicer!). Several long tables were set up with chairs along either side, one side for families and one side for interviewers. One of the many great things I was to witness, was that many of the initial screeners were local high school students who had trained to be the ones who asked the questions to get the patient charts started. How cool to see kids helping kids. Inside the hospital were multiple stations through which each child would pass. They would be weighed and measure, photographed and x-rayed. Vitals would be taking. Tests of hearing and blood would be administered. 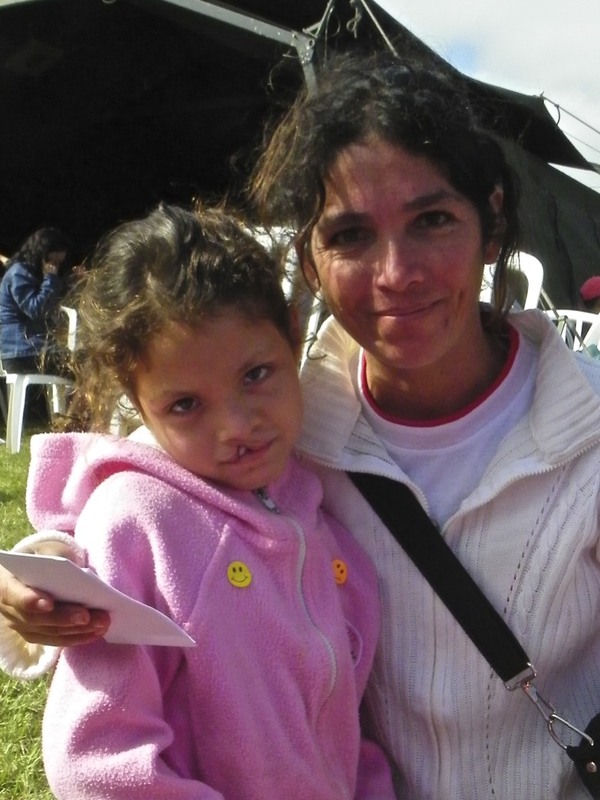 They would be evaluated by nurses, surgeons, anesthesiologist, audiologists, speech therapists, dentists and orthodontists, who had traveled to Paraguay, coming from countries all over the world, for no pay. Some children were deemed not healthy enough to be able to tolerate surgery. This was determined by things as simple as being extremely underweight, anemic or having a fever. And although that decision might be made at the first station, all patients were encouraged to stay and see all of the doctors in hopes that causes for the issue that excluded them could be discovered and treatment started. Pretty cool, huh? These children will be at the top of the list when Operation Smile returns in 6 months. Being the non-medical type, as in I get faint just visiting people in the hospital, my job was to play with all the kids who would spend much of the day waiting, waiting and waiting. There were so many kids. Easily as many, if not more, did not have clefts; these were the patients’ siblings. Lots of kids, need lots to do. To that end I brought 2 huge suitcases filled with toys and art supplies. I was there as the professional Play-ologist. It took a bit of time to get into the groove; the kids and I both were not sure just how this was to work. They were feeling shy and so was I. So feeling self conscious I figured, what the heck I’d do the most out-there thing I could think of and get it over with. Break the ice. Dive into the deep end. Take ‘em by storm. That is to say, start singing and dancing in front of a large and bewildered crowd who could no more understand my motivation than they could understand my English. I recruited a couple of other volunteer (grabbed is actually the more accurate verb). We put on wristbands with long flowing ribbons and started frolicking. The kids took some cajoling to join us, particularly the kids with the clefts. The siblings were much less shy–no big surprise. With timid children, who clearly looked as if they wanted to join in, I got their moms dancing and slowly they opened up. We made up a little choreography using dance moves from good old Jazzercize. The remainder of the day was spent both outdoors with the waiting kids and families and indoors with the kids as they progressed through the stations. Inside I got to spend one on one time with kids and more than a few nestled themselves into my heart. Knowing that I’d be able to shadow a few children through their surgery day staying with them through the whole process, I started writing their ID numbers onto my hand so that I might ask to be with them. Funny thing is that by the end of the day many of the numbers had washed off. When I was asked to describe their deformity so that the medical person I was asking might recall which kid I was talking about, I couldn’t do it. I’d spent the whole day with the kid, together solving geometric puzzles or using stencils, but I hadn’t noticed why they were here. With so many kids with clefts, I just stopped noticing. 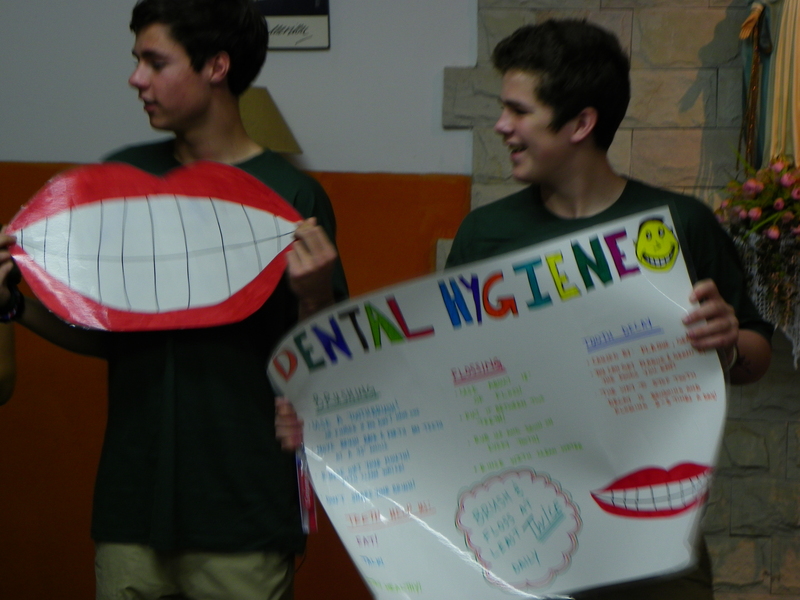 giving a dental hygiene presentation. Additionally, this day was one that was super busy, for the two American teenagers I was there to chaperone. They were there as educators and came equipped with posters and all manner of gimmicks to get the kids’ attention and then teach them about proper dental hygiene, hand washing and nutrition. In some countries where Operation Smile goes the students also teach about, dehydration & diarrhea prevention and burn prevention & care. 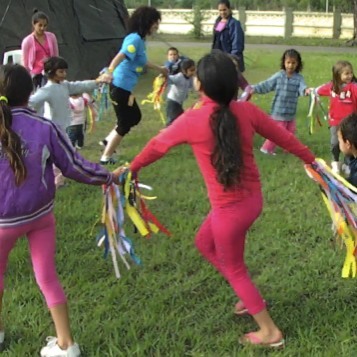 In Paraguay the families we met all had clean running water and did not cook over open fires, so my two students focused on the other learning modules. 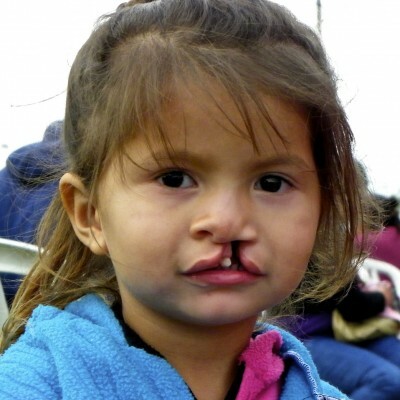 It’s really wonderful that Operation Smile has such a well thought out program to teach young Americans to become lifelong volunteers. Kids helping kids really is something special. Way to go Op Smile! It was an uphill battle to get the kids to pay attention to my two students as they made their presentations. What with the carnival atmosphere of hundreds of kids on a big field with free toys and art supplies, soccer games and jump rope games, singing and dancing, and even someone dressed in a giant chicken suit (I think promoting a sandwich shop), the kids were more than a little bit distracted! But Hunter and Brendan plowed ahead undaunted. They really were troopers and kept a cheerful attitude through out! And, luckily the next day they would be presentation rock stars when they had a more receptive audience! THIS IS MARIA. I DIDN’T GET HER NAME THAT FIRST DAY. BUT ON THE DAY OF HER SURGERY I WAS FINALLY ABLE TO GET HER TO OPEN UP. WHO WOULD HAVE GUESSED THAT IT WAS HOT WHEEL CARS THAT WOULD MAKE HER SMILE?! I WAS GLAD WE HAD FORMED A BOND AND I WAS ABLE TO HOLD HER HAND AS SHE WALKED INTO THE OPERATING ROOM. Tomorrow we go to the hospital and families find out if their kids were selected. I am sure it will be powerful both for the joy and the sorrow. 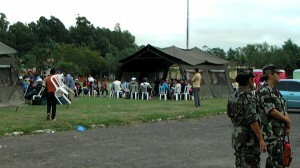 In Paraguay, the local team has psychologists to talk to each family about why their child was not selected, what they can do next, and are able to refer them for services locally or help them to understand the process for applying to come to the States for cases too difficult to be done in Paraguay. The following day, surgeries will begin. 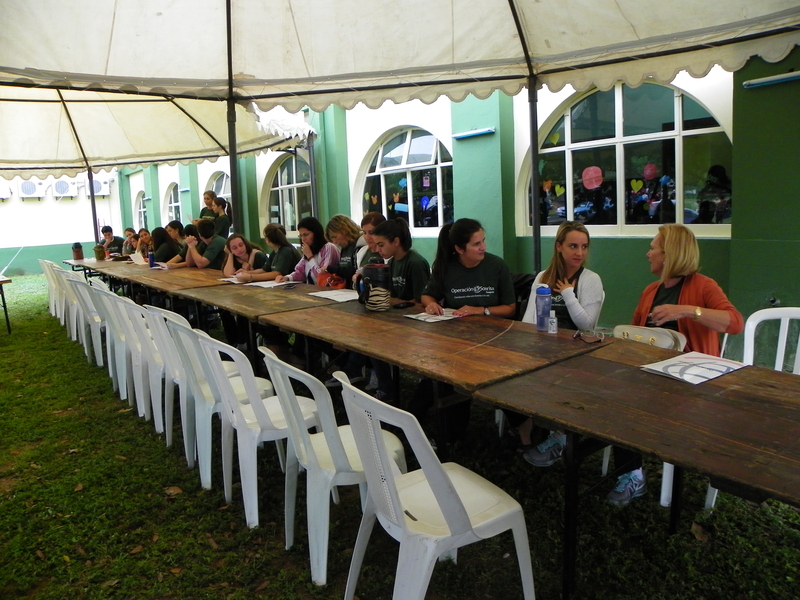 It will be 5 tables going all day for 5 days; the days will be long–ten to twelve hours and about 20-25 cases a day. Feeling so lucky to be here. Every minute of everyday, something MMS (Made Me Smile)! Smile. Be happy. Be happy you can smile! P.S. : If you ever go to a small hospital where hundreds of people will be using just 2 toilets, bring toilet paper. ← Fats Waller Cracking Me Up!